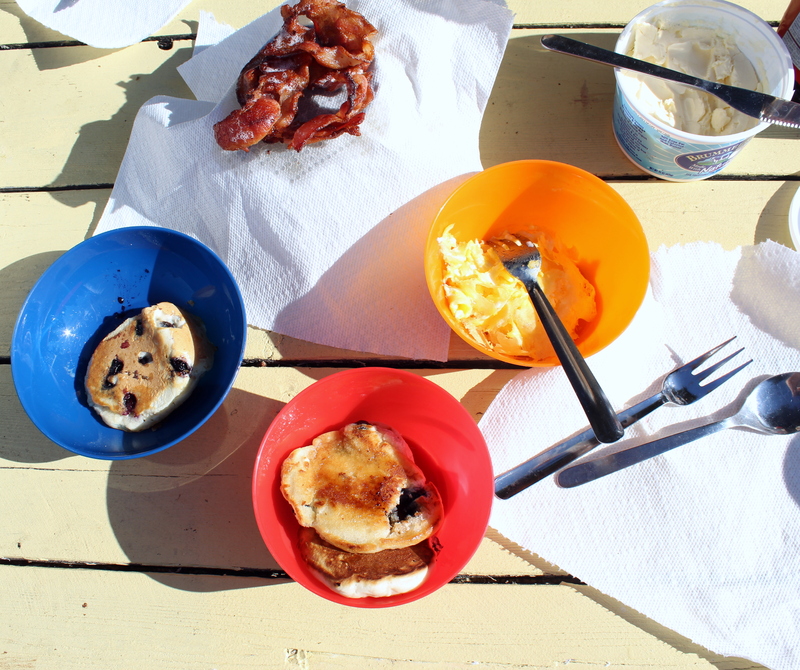 With what little time we have left this summer we decided we needed to get in a camping trip and pairing it with an island getaway was the perfect combination! Friday evening after work we hurried home, threw the food and puppy in the car and made a made dash to the Anacortes ferry. We arrived at our camp site close to 10:30pm totally exhausted and still having to set up the tent…along with a barking dog who was not used to seeing people walking around in the dark with head lamps. We opted this time for a 6 person tent, which is definitely the way to go. 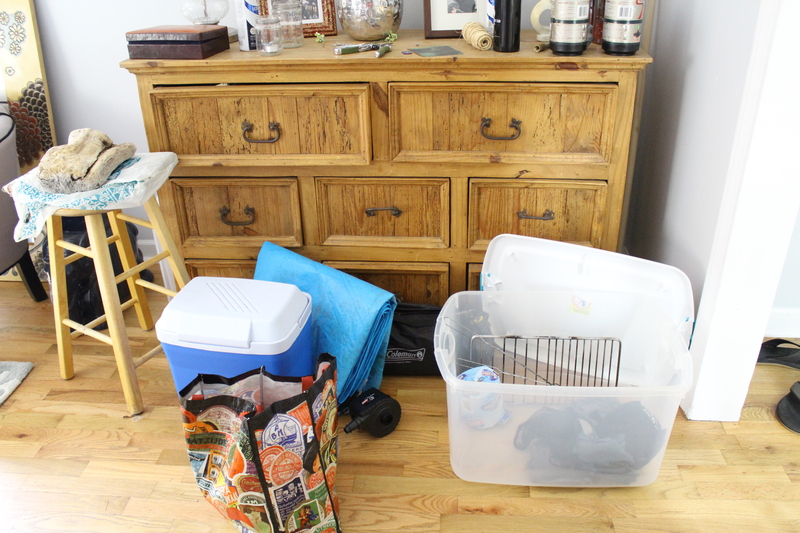 We were able to fit a queen air mattress along with a dog crate and all of our bags. I am a bit of a contradiction when it comes to camping. I love sleeping outdoors and sitting around a campfire making breakfast…and yet I wake up and the first thing that I do is march straight down the hill to the restaurant to pick up a few lattes. I decided that I didn’t want to waste time boiling water, but my latte tasted pretty darn good and went very well with the bacon, eggs, and pancakes that Jesse cooked back at the site. 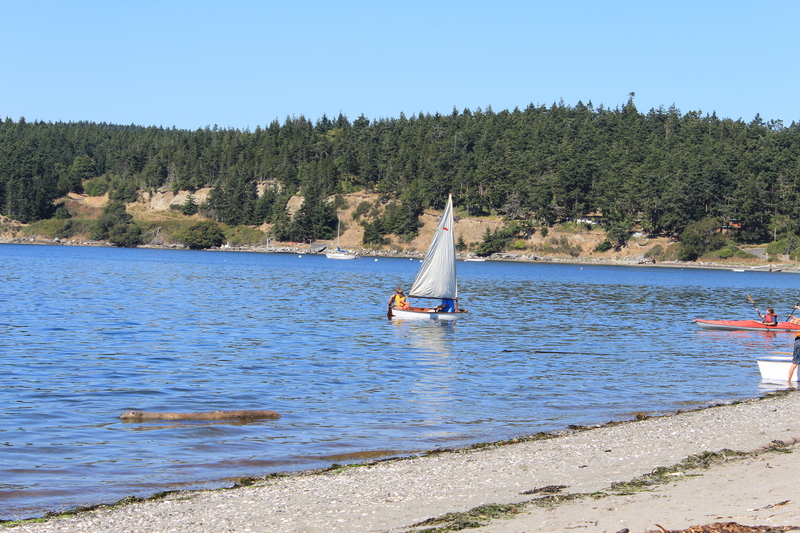 After cleaning up, which consisted of wiping out the bowls and putting them in a plastic bag to deal with when I got home…it was time to head up to the Lopez Island farmer’s market. The little village was pretty cute. 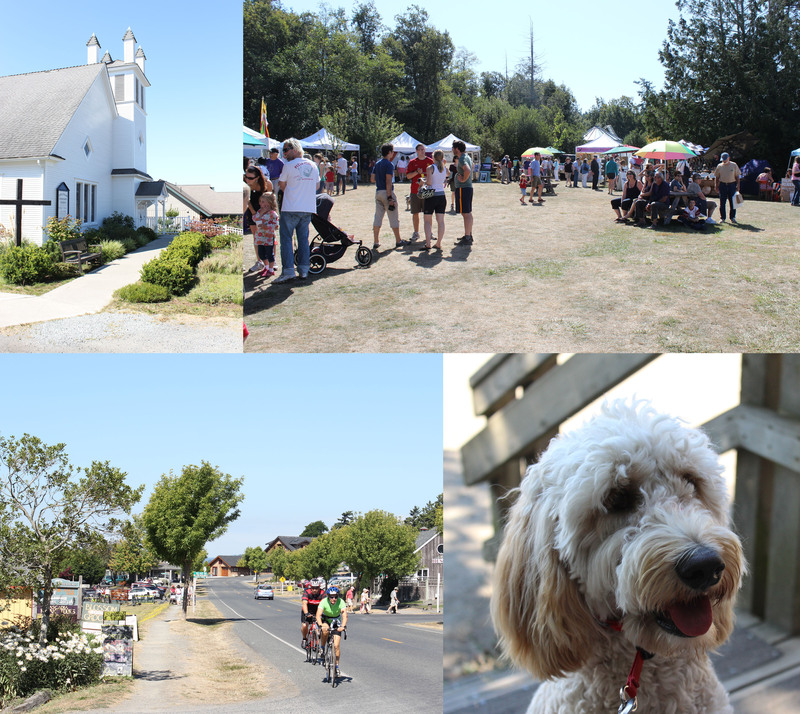 There were bikes, kids running around, hippies, and dogs. Everyone was just hanging around in the sun. 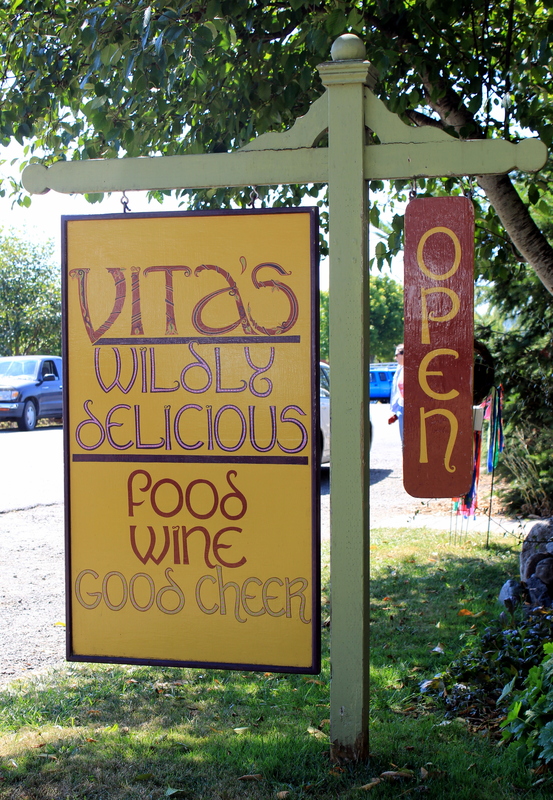 We found the best little deli for lunch, Vita’s, with an outdoor patio to soak up the incredible 80 degree weather! And it was wildly delicious! 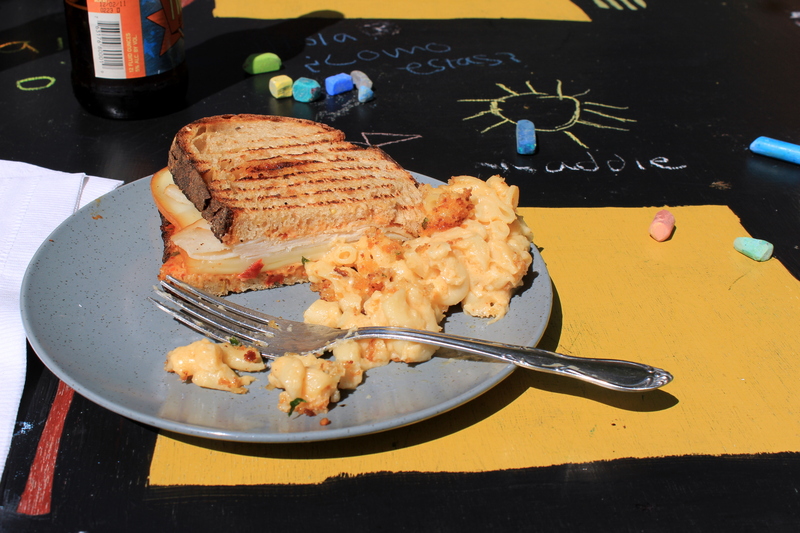 We split macaroni and cheese and a turkey panini…my two favorites – cheese and carbs! MMM! And really why I post about Vita’s isn’t just because we ate well, but check out the tables! 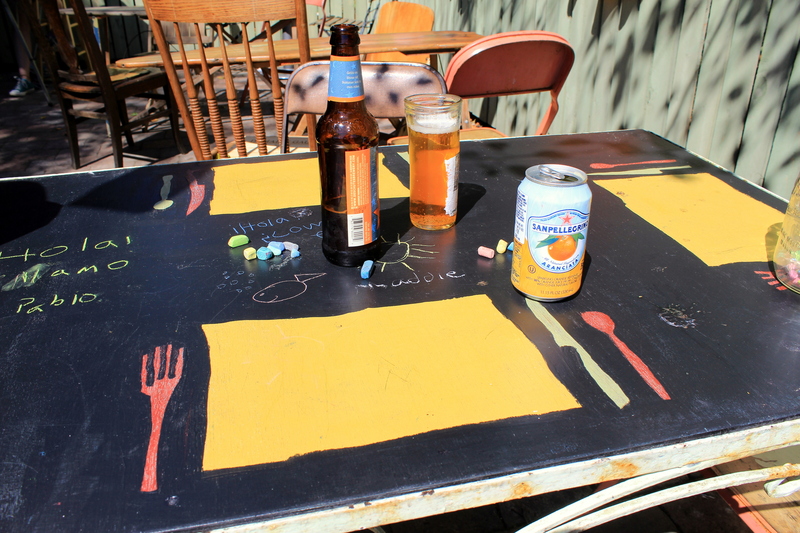 The are painted with chalkboard paint for the background and then painted with place mats and table settings! I obviously know that this has been done before, but it the first time that I have ever gotten to sit down and write with chalk on the table while waiting for my food! It was actually a lot more fun than I would have thought…I drew a sun. The remainder of our day was spent exploring the island. We found the best little stretch of beach along Mackaye Harbor and pulled out the picnic blanket, cheese, crackers, and wine! To be completely honest, my last 3 camping trips have all consisted of a cooler with cheese, crackers, and wine. It’s obviously become one of my camping staples. This was definitely my favorite beach on the island. 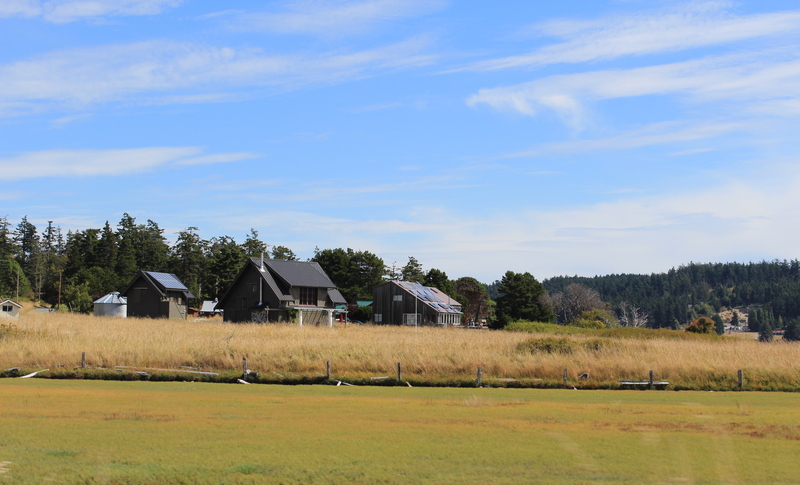 And as we walked along the beach, the tall grass parted and I saw this house! 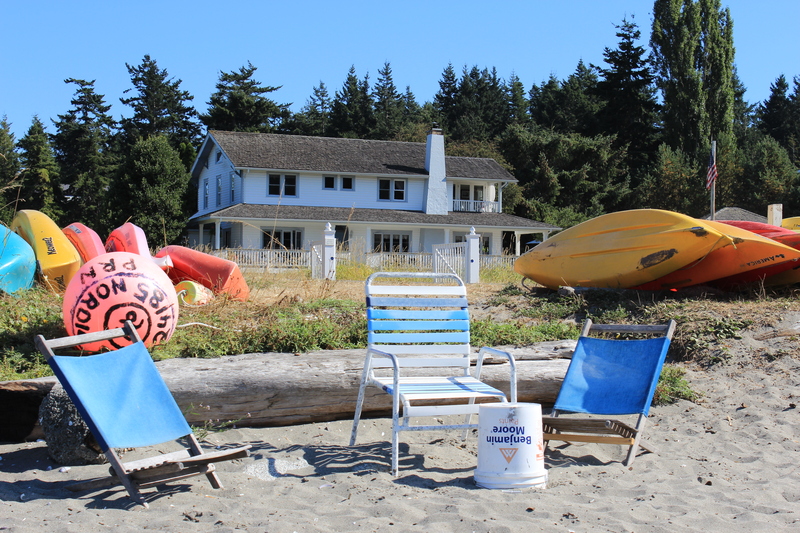 Isn’t it just lovely…I think it must be the West Coast version of the house from Something’s Gotta Give. I could definitely see myself relaxing on that porch! 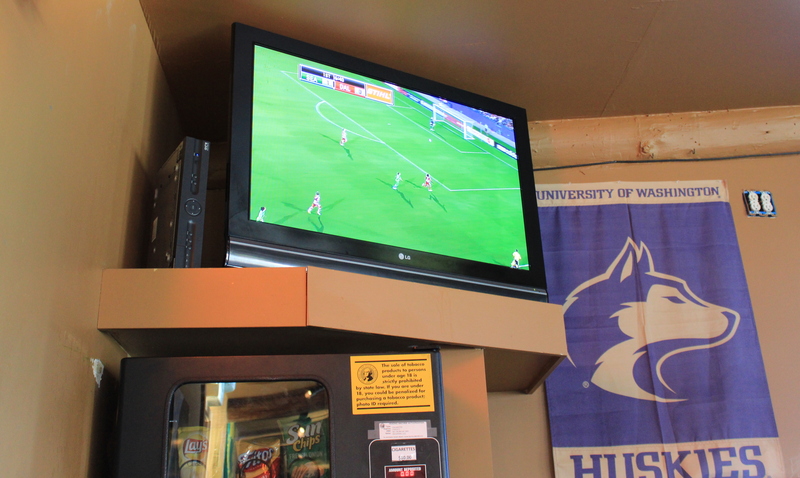 With 6 o’clock quickly approaching, we had to make a dash back to the camp site (and by camp site, I mean bar across the street from camp site) to catch the Sounder’s game. That’s right…we totally know how to rough it out there in the wilderness! And by the way – Sounder’s won! It was a great game. And after the game, did we fire up the old camp fire? Nope, we sat out on the deck overlooking the marina and ate seafood! 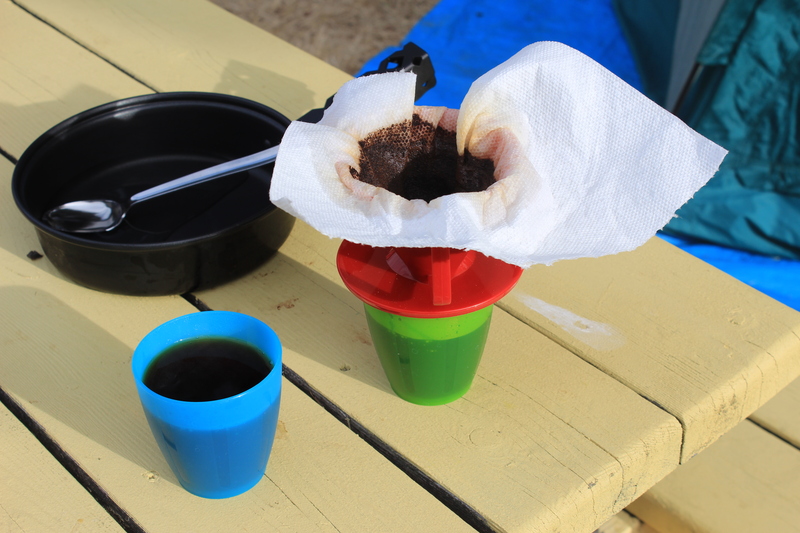 But to make up for my lack of ruggedness, I did in fact boil my own water to make coffee the old fashioned way. 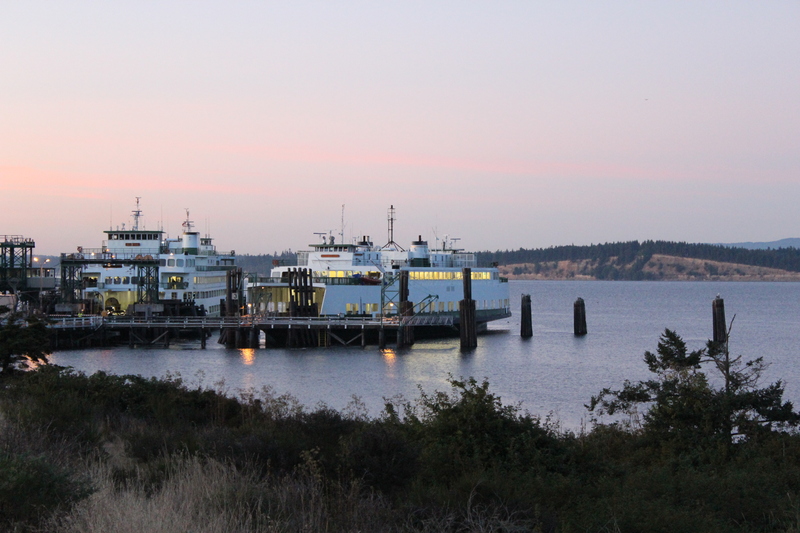 We quickly felt the rush to get inline for the homeward bound ferry, which was a good thing seeing as though after waiting an hour and a half we made the ferry by 1 car, and saved ourselves from waiting an additional 3! 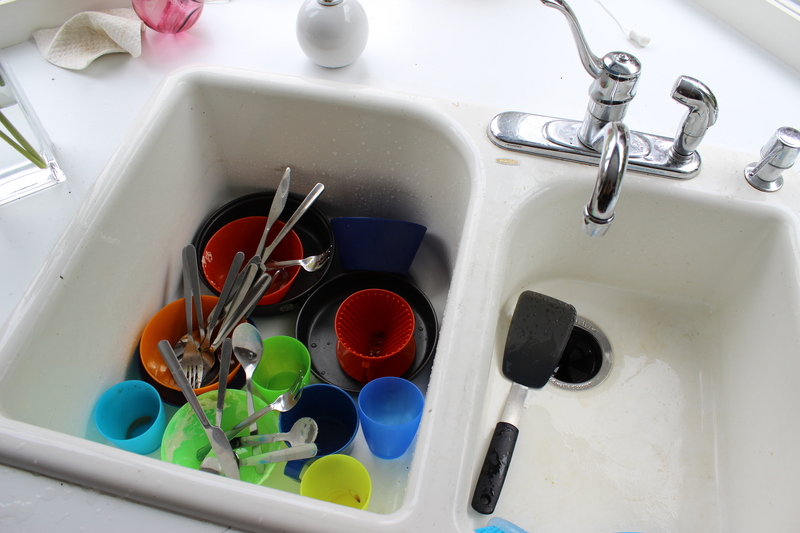 But every good getaway does have it’s realities…Monday morning this was my day! 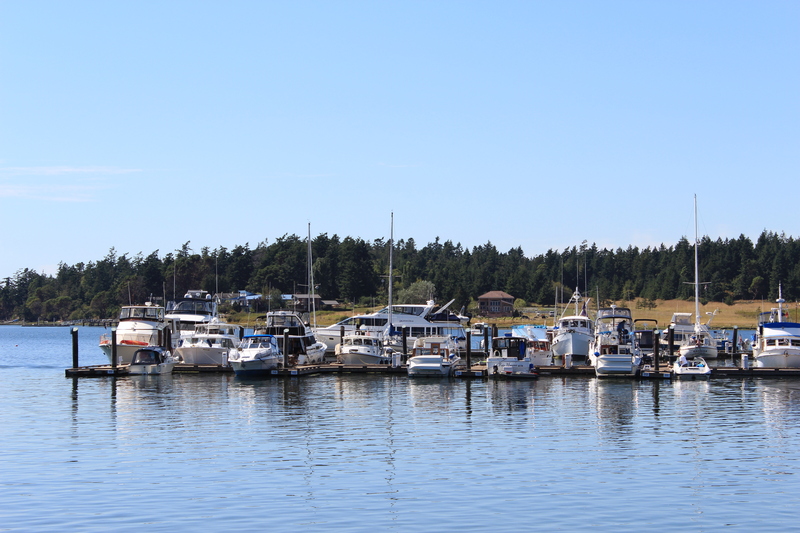 You definitely have to make it out to the San Juan Islands! They are gorgeous and you can just ferry around with a bike!